The 10 Best CrossFit Gyms in New Mexico! The first step to joining a gym is finding the right community of people to work out with. CrossFit gyms bring a diverse group of people together all with the same goal: to help each other feel healthier and stronger. 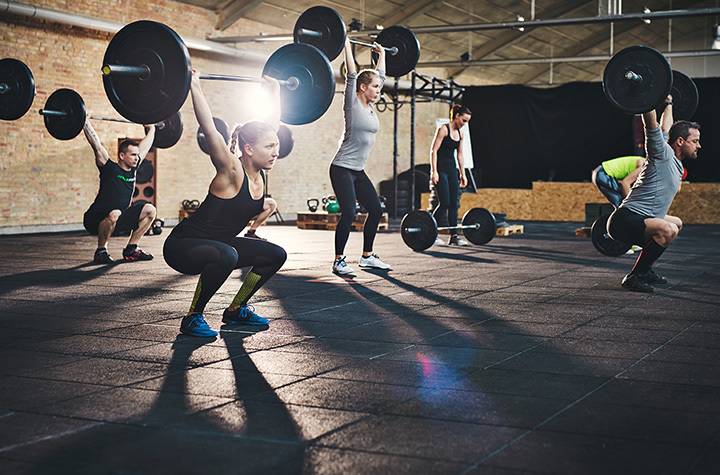 With high-intensity workouts and a challenge for all levels of fitness, here are the 10 best CrossFit gyms in New Mexico. Challenge your limits at this beautiful facility located in the foothills of the Sandia Mountains. The views are inspiring. With more than 6,500 square-feet of workout space you’ll be able to exceed your fitness goals. Begin with a fundamentals course then as fitness levels improve move on to the cross-fit group class, a high intensity strength training or cardio workout. Yoga, a kids and teens program, a barbell class and dynamic coaches round out the options here. Spend some time at this establishment and you’ll get familiar with kettlebells, barbells, medicine balls, jump ropes and pull-up bars as part of a regular workout. In the process, your overall fitness will improve and you’ll be stronger and healthier. The focus here is on the customer’s physical goals … check out the no sweat intro class or jump right into one of the CrossFit foundations classes. Sign-up for the Workout of the Day. Encouragement, community, family and daily practice all are joined together at this “box of enchantment” to help build confidence, inspire perseverance and, in the process, help members become healthier people. Before you commit, stop by for a free introductory class. Training here is intense, efficient, functional and a lot of fun. A great fitness routine for all ages and abilities. Take the family! Training here is a combination of gymnastics, weightlifting, plyometrics, running, rowing, climbing and just about anything that involves fitness. The programs are intense and challenging, but the results show in increased fitness levels, weight loss, sports performance and improved health. This is not a typical gym, but a training facility that focuses on education and instruction to exceed physical and mental capabilities. No quick fix here, just hard work. All ages, skill levels and backgrounds are welcome at this community minded, member supported fitness center. The CrossFit classes are varied and designed to meet multi-level fitness goals. Workouts are short, high-powered sessions that are scalable to individual needs. Classes are everyday of the week. Private training available also. Begin here with a no sweat consult before ever getting into workout clothes or picking up a barbell. This free session is tailored to identify individual fitness goals. Once you join, beginners start with a LightFit class before transitioning to a traditional CrossFit program. The program is focused on lifestyle changes that build comprehensive physical fitness and restore vitality. Strength, barbell and gymnastics clubs, plus nutritional counseling and personal training available. A friendly, competitive, supportive environment is at the heart of this club. All are encouraged to set and meet their own goals … those who achieve the most get the most cheers. Join by the month or year. Dip your toe in with a punch card for a 10-session commitment. Discounts for military, veterans and first responders. Workouts are scaled to fitness levels, but all are pushed to exceed those levels for optimum fitness. Free classes on Friday and Saturday provide insight into what the CrossFit program is all about. If you like it, the next step is to sign-up for either the Essentials or OnRamp course. All ages, fitness experience and interests are encouraged and welcomed. Programs empower and educate members to make the most out of workouts, diet and lifestyles. Drop-ins are welcome. The motto here, “We don’t use machines, we make them,” underscores the focus on how CrossFit can support an active lifestyle. It’s more than just being able to run faster or lift heavy stuff, it’s about being fit enough to cross over to any physical endeavor, sport or activity. Newcomers get a free week of training before committing to a program. Workout of the Day, Olympic lifting and CrossFit kids all part of the package. While technically not a CrossFit gym, EliteFit Cross-Training provides a similiar routine that combines gymnastics, weightlifting, and other endurance workouts. Classes here are a combination of exercises that strengthen various body areas, while at the same time reducing the risk of injury and improving overall fitness levels. Variety is promoted. Daily classes, team workouts, strength and conditioning instruction, and an EliteFit program ensure that any activity is effective and challenging. Try a free class as a warm-up.